Microsoft launched many exciting features as a part of Embedded Intelligence in Dynamics 365 Customer Engagement. Embedded Intelligence has key capabilities– Relationship Insight, Auto Capture, and Email Engagement, which enables you to track email statistics and engage customer more timely and effectively. 1. How many time email messages opened. 2. Follow if attachments are opened or not. 3. Number of time links in email clicked. 4. Replies to the email. Along with these statistics and a chronological view of different action performed by recipients, you can also set reminders to follow up with an email and set ‘Send Later’ to match the recipient’s time zone or working hours. 1. Navigate to Dynamics 365 > Settings > Administration > Intelligence Configuration. 2. Under Sales Insight > Accept (Step #3). 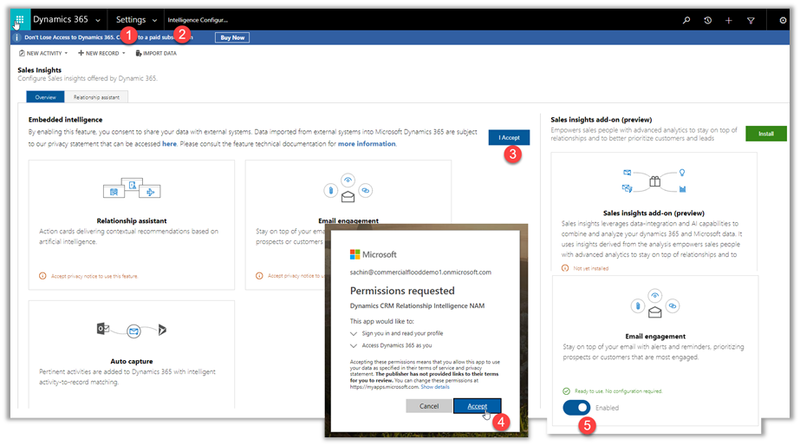 Note: One should have Dynamics 365 administrator and Office 365 Administrator permissions to install it. 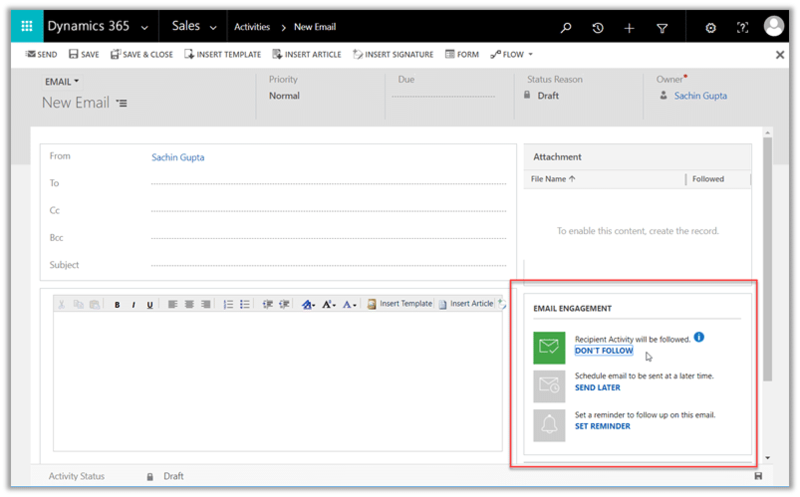 Email Engagement navigation shown in this blow is as per Dynamics 365 v9.0.2. 1. OneDrive for Business must be available to your Dynamics 365 tenant if you want to enable the ability for users to follow email attachments. 2. 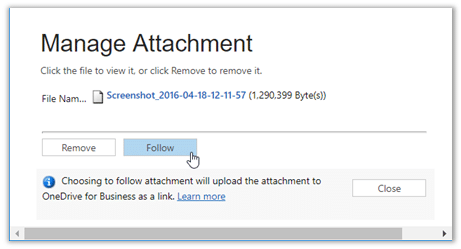 To use followed email attachments, you must also enable document management for email in Dynamics 365 instance to follow email attachments. 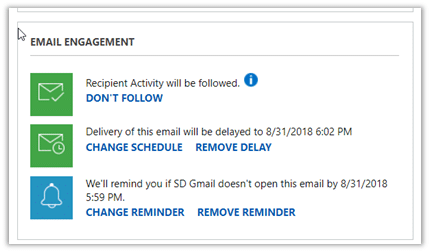 Navigate to the new email form, and you will notice a new section for Email Engagement is added into the lower right corner with 3 options – Don’t Follow, Send Later, Set Reminder. 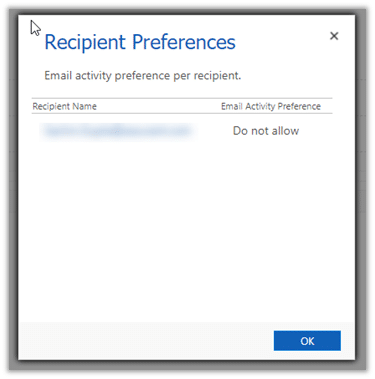 This option will let you know when a recipient opened an email, clicked embedded links, opened attachments, or send a reply. By default, Dynamics 365 will follow all the new emails created within Dynamics 365. You can explicitly opt out to not follow any specific emails by clicking Don’t Follow. 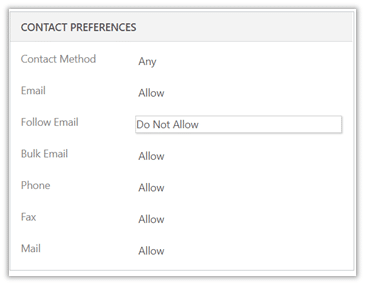 Users can also disable follow option permanently for a specific contact by updating its contact preferences from Follow Email to Do Not Allow. To track an attachment, add the attachment to the email and then click on the Follow button from the attachment window. Once the attachment is enabled for tracking, it will show up as an attachment in email body as well. 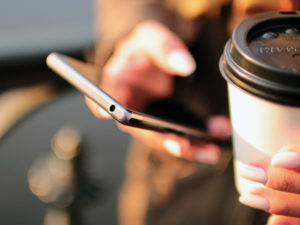 You can create an email at your convenience and schedule it for delivery based on recipient’s time zone or working hours, so it’s more likely to be read or responded to. 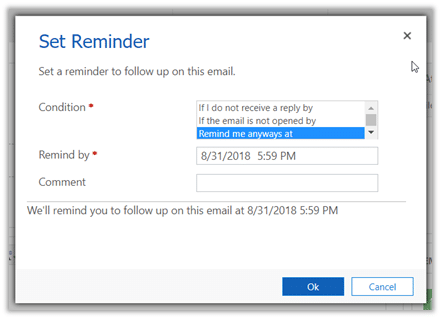 Once you click on the Send Later option and specify the date and time, the system will send out an email automatically on that date and time. Now you can set reminder if a customer hasn’t opened your email or responded back to you. Alternatively, you can also set a reminder to just follow up with a specific recipient. 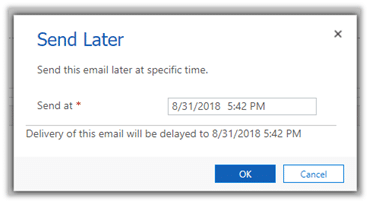 Note that once an email is sent out, Delay Send and Reminder can be removed/disabled, however Follow can’t be removed once an email goes out of the system. Email Engagement is available now in Dynamics 365 Online, version 8.2 onwards. Please refer to Configure and enable embedded intelligence to get more details on how to configure embedded intelligence. Note: By enabling this feature, you consent to share data about your customers’ email activity with an external system. Data imported from external systems into Dynamics 365 are subject to our privacy statement. Learn more about Microsoft Dynamics 365 by reading our blog!